Current EVEntS – Jessica Lynn Howell’s 14 Month Old Daughter Sodomized and Killed by “Boyfriend” | It's the Women, Not the Men! 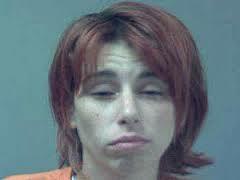 Jessica Lynn Howell, 25 – allows her little girl to be brutalized and murdered. Jordan Lafayette Prince, access to her 14 month old daughter but according to police, “encouraged” her boyfriend to assault the toddler. This deviant raped, sodomized and then strangled little Ashlynn to death. I can’t bring myself to write any more about this heinous abomination other than to say that we can thank second-wave feminism for the sexual revolution and the destruction of the concept of motherhood and third-wave feminism for the proliferation of secularism, pop culture and paganism for bringing forth the reincarnation, in these two reprehensible reprobates, of the ancient demons, Succubus and Popobawa, in our formally joyous, Christian society. Ashlynn is now safe in heaven with God but we are not! God help us, as radical feminism continues to spread, unchecked, among our children. Yes, bring back school prayer. You know, way back when I was in high school, I had attended a Christian private school, and hated every minute of it. Even during prayer time, I didn’t give a care, and would just shrug my shoulders if I happened to make a noise, and disturb the prayer. But now that I know how powerful prayer is and how gracious God is, He sure was merciful to me so many times then! Yes, bring back school prayer. Even if unappreciated now (by those attending a Christian school), it will definitely be well remembered to every child later. The prayers, instilled in children, have saved many generations of adults too. They are something few forget because they are something we find so comforting as stress and responsibilities fill our adult lives. I often feel sorry for the millions of young people denied their consolation by the arrogant, elitist, 1963 U. S. Supreme Court. Please “search” for my post “Positive Powerful Prayer” you may find it interesting as well. Thank you for your comment.